Australian farmers are fighting to contain the greatest threat to the country’s 600 million AUD banana industry after news that TR4 has been detected in northern Queensland. The announcement on March 4 that a suspected case of tropical race 4 (TR4) — the fungal strain that causes Fusarium wilt in Cavendish bananas — had been detected on a Northern Queensland's farm took everyone by surprise, including the Australian authorities who thought they were investigating a case of soft rot, a bacterial disease. But once they realised TR4 could also be implicated, they immediately took action. The rapidity with which they went public with the news is also unprecedented and sets the bar high for other countries that might find themselves in the same situation. The chain of events leading up to the dreaded news starts 22 days earlier. 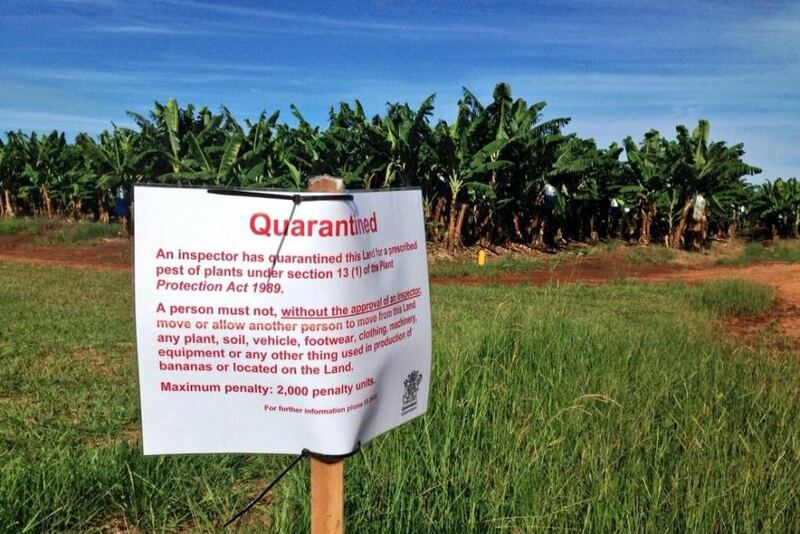 On February 10, the owner of the affected property contacts the Australian Banana Growers’ Council (ABGC) — the industry body representing the interests of country's commercial banana growers — to report diseased plants. The next day, a field officer from ABGC visits the property and takes samples. An initial assessment, based on the symptoms of some 20 diseased plants on a three-hectare section of a farm located in the Tully area, suggests soft rot from a bacterial infection. The owner is advised not to move any soil or banana plants off the property until the situation is resolved. The samples are submitted to Queensland's Department of Agriculture and Fisheries (DAF) for diagnosis. Even though the symptoms are not consistent with those of Fusarium wilt, the samples are also tested for Fusarium, a common soil fungus that often secondarily infects sick plants. On February 19, the tests confirm the presence of bacteria responsible for soft rot, but one sample also tests positive for Fusarium. The next day, the Fusarium cultures are sent to Brisbane for TR4-specific tests using the PCR molecular technology. On March 3, an initial positive result for TR4 is received. On March 4, the affected property is quarantined and press releases are sent out. On March 15, the results from samples sent to Darwin for additional PCR testing support the initial diagnosis. Meanwhile in Brisbane, scientists are still working on the more lengthy vegetative compatibility analysis. The test is based on the ability of the fungus' hyphae to fuse and form stable heterokaryons (cells containing two distinct nuclei) with known types. It should confirm the vegetative compatibility group (VCG) of the sample as VCG 01213/16. In the meantime, DAF's Biosecurity Queensland set up control centres to coordinate the response in Brisbane, South Johnstone and Tully. It is also continuing with its surveillance program to try to determine the extent of the problem. As Chief Biosecurity Officer Jim Thompson told the media, "we have been testing samples from a number of sites on the original property and connected family properties in the immediate vicinity, as well as one nearby property where we have traced the movement of equipment. This is a standard precautionary process and at this stage there has been no confirmed detection of the disease outside the quarantined farm." Biosecurity Queensland's investigations have yet to pinpoint the source of the infection. This is the first time TR4 has been detected in Queensland, where roughly 95% of the country's bananas are grown in the northern part of the State. In the late 1990s, however, TR4 wiped out most of the banana plantations in the neighbouring Northern Territory, but the owners of the locked down farm in Tully told ABC Rural they had never travelled there. The movement of banana plant material from the Northern Territory to Queensland is also prohibited. Besides infected planting material, the fungus can be spread through the movement of infested soil or water. The message to Queensland's banana growers is 'Come Clean, Leave Clean'. They are urged to ensure that shoes, vehicles and equipment are cleaned before entering or leaving their farm. Tourists are also asked to avoid entering agricultural areas where bananas are grown. It is feared however, that heavy rain and flooding sparked by Cyclone Nathan might have contributed to the spread of the fungus. The consequences of not containing the fungus could be huge for Tully valley growers, who produce nearly half of Australia’s 500,000 weekly boxes of bananas. For the time being, however, the impact of the disease scare is that it is changing farming practices, including fencing off banana fields. As Tully grower Adrian Crema told The Weekend Australian, “there’s every chance we can contain it and slow its spread; we need to learn from the mistakes of others (in the Territory and overseas)”. He also noted that growers have banded together before to work through crises. “Don’t write us off. It’s serious, but this is our speciality: dealing with disease and disaster."